Where is the Easter Bunny? Downtown of course! 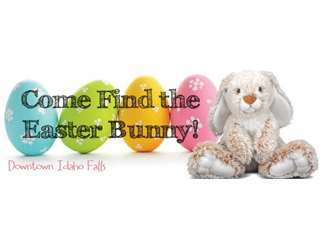 Come downtown Saturday, April 20th from Noon to 3:00pm and go on a hide-and-seek adventure to find the hidden bunnies! We have hidden the bunnies in the downtown shops and you need to come find them! Come first to the Civitan Plaza (corner of B Street and Park Avenue) and we will give you a map. Once you have found all the bunnies go to ‘WeeBee Toys’ (492 Shoup Ave.) where you will be able to pick out a prize and meet the Easter Bunny!